It is truly rare when someone you have never met before, know little about and have seemingly few things in common with can affect your entire day, changing your attitude and uplifting your mood. This is what twenty-year-old Cork native Joanne O’Riordan did for me. Between a mountain of college work and society commitments, I have to admit that I entered the GMB with a million things on my mind, frankly feeling quite sorry for myself. However, upon hearing a buoyant, humble Joanne speaking so honestly about her achievements and goals for the future, I couldn’t help but feel inspired and grateful as I left. Joanne is a typical young woman in many ways, cracking jokes about her beloved Barcelona FC and the difference between Trinity College and University College Cork, where she is a third year Criminology student. 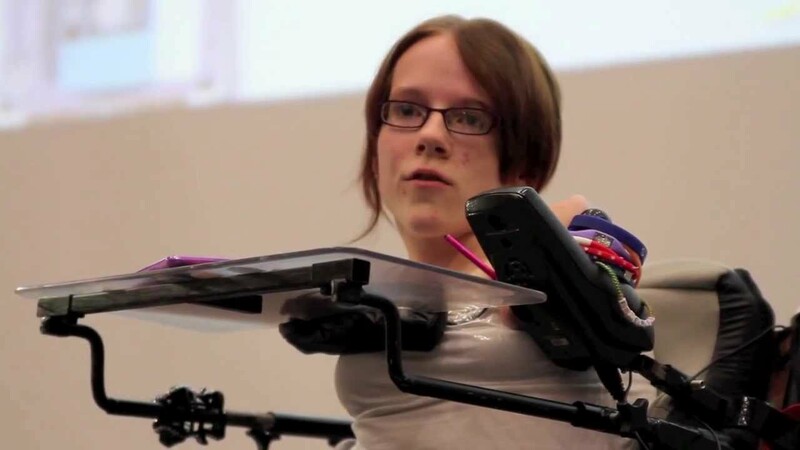 However, she is one of only seven people in the world living with Tetra-Amelia syndrome, a disease characterised by the absence of all four limbs. Despite this incredible limitation, Joanne has successfully taken on Enda Kenny in securing disability funding in the 2011 budget, was one of the first people ever to receive a standing ovation from the United Nations and received the prestigious Junior Chamber International Outstanding Young Person of the Year Award in 2015. She affirms that she uses her disability “to overcome barriers” and “become a voice for the people”. The light-hearted and unassuming nature in which O’Riordan expresses herself is what makes the discussion so engaging. She, as she puts it herself, hits us with “nuggets of knowledge” in between hilarious jokes and anecdotes, which she encourages us not to be afraid to laugh at. It quickly became overwhelmingly apparent that Joanne is utterly determined not to let her disability impair or bring her down in any way. She assures us that she “hates the word disability” and “only sees ability”. This leads her to offer an anecdote that stood out from her speech. She describes a rather cliched scenario where a psychologist holds up a glass of water. Instead of asking if the glass is half-full or half-empty, she asks how heavy the glass is. Of course no matter how heavy the glass is, it will become more and more of a strain on your hands the longer you hold onto it. This is akin to our worries and the amount of time we spend dwelling on them, an analogy I thought very appropriate in a room full of stressed out college students. After Joanne had spoken, the President of The Phil, Mathew Nuding, opened up a question and answer session. He began by asking questions on the assistance that the government could put in place to aid disabled people and inquired as to whether any of these aids were on their agenda. Joanne maintained that more effort needed to be put into making public buildings accessible for disabled people but lamented that the government say that this is on their agenda every year, but it is often swept under the rug. She emphasises that it is now “time everything comes out from under the rug” and effective action is taken to help people with disabilities. Later, when asked by an audience member how she remains upbeat despite her enormous challenges, she is typically positive, citing a need to remain optimistic for change. In the words of Joanne herself, “people amaze me”. Particularly people as resilient and conscientious as her. I believe that her inspirational story should be heard by as many people as possible and would encourage anyone to follow her outstanding example of courage and determination. From now on, I’ll always be reminded to remain positive and remember that how we deal with the challenges life brings us is what makes a person.